Apparently- my repeated speculation on Rocksteady's Arkham series is somewhat corroborated by this new tidbit of info. 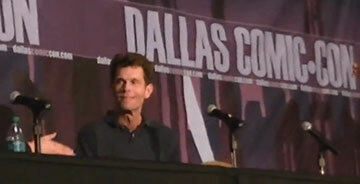 Kevin Conroy has been working on an Arkham game that IS NOT Arkham Origins. Conroy(@realkevinconroy) tweeted: "Confusion in Dallas! I am in new ARKHAM GAME coming soon, NOT ARKHAM ORIGINS coming this fall." Warner Bros. confirmed that Roger Craig Smith will be voicing Batman in Origins. So that would lead me to believe what I've said in numerous posts about the Arkham series- Rocksteady is working on the next sequel, and it's more than likely for the next gen systems. And Conroy's tweet is a sort of unintended announcement.